The Christmas season is finally here! I love this time of year. I love watching old Christmas movies . . . on VHS, setting up the Christmas tree, listening to holiday music, snow, and just about everything that comes with this season. It's definitely one of my favorite times of the year. I'm so excited to watch my 2-year-old open present this year, and excited that by this time next year, she'll have a 6-month-old sibling to enjoy as well. I have a lot to be thankful for as we celebrate this beautiful advent season. Over the past several years, I have to admit that I haven't been so into the holiday shopping as I once may have been. Is that a sacrilege for me to admit?! After all, this is Bargain Shopping Paradise, right? Eek! I do love a good holiday deal, but I just don't enjoy the crowds and frenzy of it all. In more recent years, I've really enjoyed the idea of shopping online and actually making or creating our gifts! I found some great organic AND wallet-friendly Christmas gift ideas in this article. And, if you're interested, these are some really wonderful "Homemade Holiday" ideas—and here too. So, I'd love to hear about all the money you're saving this holday season, either by shopping sales, using coupons, shopping online, making your gifts, etc. What kinds of wonderful bargains are you getting? Who doesn't need all the organizational help you can get? Certainly not me . . . I can use all the help I can get! That's why I love these FREE and CUTE printable organizers from Aimee at Sprik Space. I'm just floored at how easy, CHEAP, and fun these paper beads are! It just makes me wonder what I could do with the next round of ads that come through. Hmmm . . . These menu boards are such a fabulous idea from Christina's Adventures! Talk about something great to have around the house . . . or give as a gift. 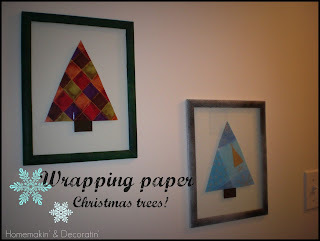 These simple, inexpensive, and adorable wrapping paper Christmas trees are adorable! I have to try this! Thanks for sharing, Jessica @ Homemakin' & Decoratin'. 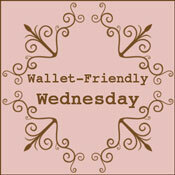 I plan on repurposing and making a lot of gifts this year to help save money. I usually find tons of bargains and so many people want them anyway, why not share?